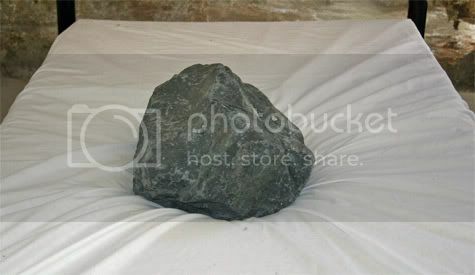 Untitled (Seed) uses the bed as a metaphor for the womb/grave, with the rock as a stand in for a person and for my mental state, both a grave stone and a seed. The metamorphic nature of the volcanic stone, basalt, is something longed for and another reference to Beuys. The rock is a marker for a missing tree, perhaps present but unseen. The basalt is a seed, a beginning and the name is a reference to Acconci’s Seedbed.